The application process for the Studies on ‘EU and Central Asia in the International System’ within the master programme in EU Studies Online has started. The study programme takes places from October 2015 to July 2017 and offers new courses on ‘EU and Central Asia in the International System’ (EUCAIS follow-up). Graduates and young professionals, who are interested in the study programme on EU-Central Asia relations, can apply for scholarships of up to 2,600 Euro per academic year. The deadline for applications is 5 September 2015. 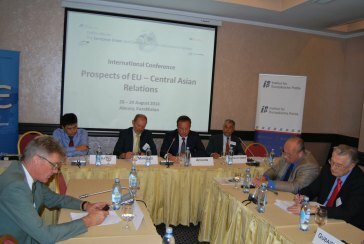 Research Course: Prospects of EU-Central Asia Relations. For a complete overview of the curriculum and the additional courses of the Central Asian branch, please download the pfd files ‘Curriculum of the Master in EU Studies Online’ and ‘Obligatory Courses of the Central Asian Branch’. The part-time study programme allows especially young professionals to deepen and complement their knowledge of the EU integration process within the global context by applying blended learning methods: a combination of e-learning and intensive face-to-face learning phases (mainly at weekends) while pursuing their careers. This study programme, contrary to other programmes at European universities, accentuates in particular the visits to European capitals like Berlin, Rome, Budapest, Istanbul, and Brussels, where face-to-face workshops take place. During these workshops, the participants have the opportunity to meet representatives of European institutions, national decision makers in charge of European and international affairs and experts from the public and private sectors. Thus they gain greater insights into the working environment of these organisations. We are looking forward to the applications of participants from the region of greater Central Asia (Afghanistan, Kazakhstan, Kyrgyzstan, Tajikistan, Turkmenistan, Uzbekistan, as well as from the Chinese region of Xinjiang and the Indian region of Kashmir) and the Caucasus region. Scholarship of 1,200 Euro per academic year reduces the tuition fee to 2,800 Euro. Scholarship of 1,800 Euro per academic year reduces the tuition fee to 2,200 Euro. Scholarship of 2,200 Euro per academic year reduces the tuition fee to 1,800 Euro. Scholarship of 2,600 Euro per academic year reduces the tuition fee to 1,400 Euro. The application for a scholarship is done within the online application procedure for the master programme, which is available at: http://www.eu-online-academy.org/EOA/en/8/Registration. Detailed information on the application process and the application form are available at www.eu-online-academy.org. If you have any further questions, please do not hesitate to contact cife-berlin@cife.eu.